Lee Strobel may be the most well-known Christian apologist of our time; he is certainly one of the most proficient, having written and co-written nearly thirty books on apologetics, in addition to working on numerous audio and curriculum series. Having read several of Strobel’s books over the years, I was delighted when The Case for Christ: Student Edition arrived in the mail last week. Beginning with his own life story and incorporating numerous stories from his time at the Chicago Tribune, Strobel engages the three major questions he investigated before becoming a Christian. These include “Who Is This Jesus?”, “How Reliable Is the Information about Christ?”, and “Can a Dead Man Come Back to Life?” In answering each question Strobel traces his own learning progression, sharing important questions he asked, answers he found, and person experiences and lessons he had along the way. Additionally, there are several periscopes into cultural topics which supplement Strobel’s general trajectory of a historical defense of Christ as the resurrected Son of God. As a student edition, this work is short, easy to read, and contains enough graphics and sidebars to keep easily distracted readers interested. One thing I especially appreciated was that this book could be read start to finish or topically, as each section was essentially self-contained. Unfortunately, often times it seems as certain apologetic authors and debaters are more concerned about winning arguments, creating media hype, or funding their ministry than telling people the message of Christ and defending the Christian faith. Strobel does an admirable job (here and elsewhere) of using his own story as the basis for sharing what he’s learned, and doing so in a personable and charitable manner. I hasten to note that this book is intended as a starting point for serious apologetic investigation, and should be treated as such by those using it. Another concern with contemporary apologetics is that it occasionally short-circuits serious engagement with questions and issues. Strobel by-and-large avoids this pitfall, telling readers from the beginning to “check out the evidence for yourself.” At fewer than 120 pages, this is clearly and introductory work and Strobel does an admirable job touching on the highlights of an apologetic for Christ without glossing over important controversies. It would have been nice to see some suggestions for further reading or engagement with certain questions or topics. As only a few opportunities for follow up are offered, by the end of the book it wasn’t clear where to look for further guidance on the questions being posed. Occasionally, apologists come off as all knowing, as if all the answers to life’s questions can be found in the pages of apologetics books (Or, if you have real questions, maybe at an apologetics conference. Oh, and the Bible too…). Strobel does an excellent job of noting common problems found with the historicity of Christ and the Christian worldview and addresses those concerns with a variety of sources, including his experiences, historical research, and the insights of several well-respected scholars (most notably Ben Witherington III and J. P. Moreland). This type of apologetic work should be a reminder that a) we don’t have all the answers, b) it’s alright to ask questions about our faith, and c) hard work and research can be a worthy learning experience. A final thing worth noting is that, with rare exceptions, few people are going to be convinced to change something as foundational and influential as their worldview simply by reading a book. Certainly reading and research can (and should) be part of learning about the Christian faith. But as Christians, we cannot assume that Lee Strobel (or any other apologist or evangelist for that matter) is going to convince the world that they need Christ. Instead, person-to-person conversations and genuine, loving relationships are what really open hearts and minds to truth, and knowing about your own faith is key to knowing the “reason for the hope that is in you” (1 Peter 3:15, ESV). 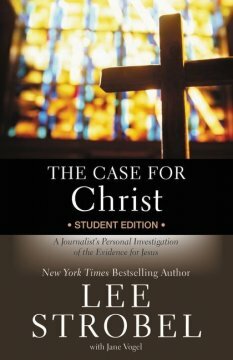 Overall, The Case for Christ: Student Edition is recommended as an excellent beginning resource for students, both those interested in learning more about the Christian faith, as well as those brought up within Christianity who are facing questions about Christianity. As noted above, this book should be used as a starting place for asking and thinking about serious questions. But as a starting place, it’s truly worth your time. I received this book from Zondervan in exchange for my honest review. All opinions expressed are my own. What’s the difference between the student edition and the original?